This dog carries two copies of CuC which results in a curly coat. This dog will pass on CuC to 100% of its offspring. This dog carries one copy of CuC and one copy of Cu which results in a wavy or curly coat. This dog will pass on CuC to 50% of its offspring and Cu to 50% of its offspring. This dog carries two copies of Cu and has a straight coat. This dog will pass on Cu to 100% of its offspring. The Cu Locus (Curly hair) impacts hair curl as a result of a DNA variant in the KRT71 gene which produces a form of keratin, a major structural component of hair. The CuC variant of KRT71 prevents keratin from binding together in a regular pattern which alters the structure of the hair and results in a curly coat. 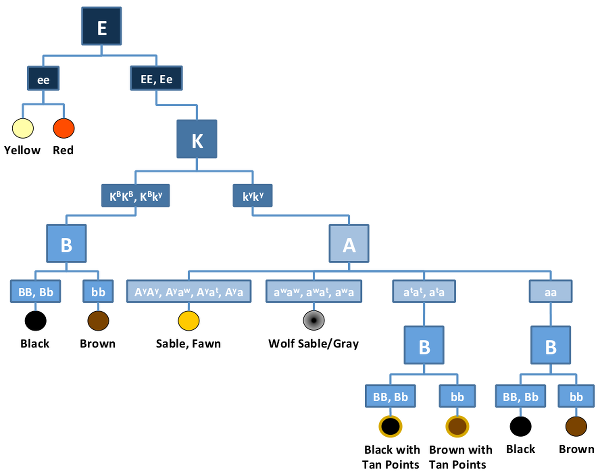 Genetic testing of the KRT71 gene will reliably determine whether a dog is a genetic Carrier of a straight coat. Curly coat is inherited in an autosomal incomplete dominant fashion meaning that only one copy of the CuC variant is required to produce a curly coat. However, due to the incomplete dominant expression of the CuC variant, dogs with only one copy of the CuC variant (CuC/Cu) can have a "wavy" or moderately curly coat that is in the spectrum somewhere between a curly and a straight coat. Dogs with one copy of the CuC variant (CuC/Cu) are also carriers of the variant for straight coat (Cu) and can produce dogs with a straight coat if bred to another Cu carrier or straight coat dog. Therefore, dogs with two copies of Cu will have straight hair, dogs with two copies of CuC typically have a tight curly coat and dogs with one copy of Cu and one copy of CuC typically have a looser curl or wavy coat.